9.8 kg. , 21.7 lbs. It was the last day of our spearfishing trip and my brother Tyler and I had been looking forward to hunting a specific sunken island on the lake. We headed there first thing in the morning and were careful not to spook the fish upon arrival. I went one way and Tyler went the other way around the small island. I followed a ten-pound northern pike initially but decided not to shoot because I was looking for something a bit larger. We met up on the other side and decided to head back around the island but this time I decided to swim through the middle water which is shallower, about 6 feet deep. As i approached the shallows I spotted it in the distance, motionless half way off the bottom in the tall vegetation, I knew this thing was a monster. I like to take broadside shots at fish so I needed to get a bit closer to the bottom to become horizontal with the pike. I let out air instead of taking in a breath which helps to slowly sink towards the bottom. Once deep enough, the next step is to advance through the weeds, careful to be undetected. As I get into polespear range it starts to gently swim away, making it a longer shot, but I aim behind the gill plate and let it go. The pike takes off and the chase is on, dragging my polespear around like a twig. The pike stops in approximately 20 feet of water off of the island, which is about 70 yards from where I first shot it. After catching my breath from following the fish, I dive down and secure the fish holding it tight to my body and bring it to the surface. 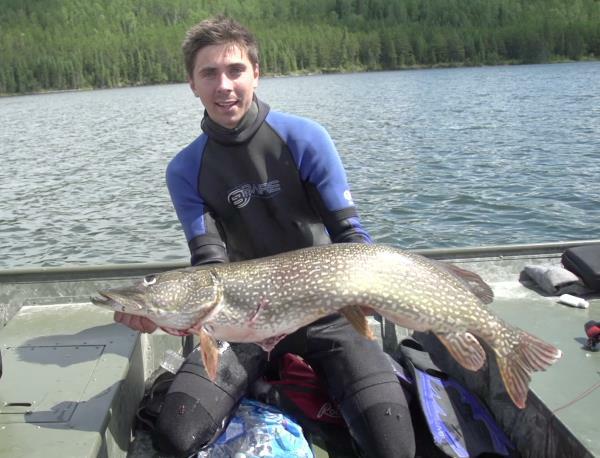 I knew from the sheer girth of the fish it was over 20 pounds and that I had probably just taken a World Record!